Having developed a short-lived interest in film production, I took a class in high school called “Electronic Media.” We had an assignment where we watched a video interview with the then graduating class of 1991 in order to witness the advancement of film editing techniques over the past ten years. When asked the unavoidably generic question ,“Where do you see yourself in five years?” most replied with the equally generic answer of having the job of their dreams, getting married, having kids, blah, blah, blah. But there was one student who said she hoped to find an alternative fuel source to crude oil and that she also hoped to be part of this solution. Emily Dickinson said “Forever is composed of nows.” It’s more than likely that fresh-faced teenager who wanted to be part of a solution for a better world became an adult preoccupied with raising children and paying a mortgage, and let those youthful ambitions fall by the way side. Not that there’s anything wrong with a change of priorities, but what happens between youth and adulthood that makes people stop caring? I guess one could argue that taking care of a family and securing a future for said family are more important than ending world hunger. To me, that seems a little selfish. 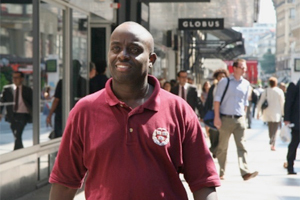 Take Chris Mburu , the Harvard law graduate from Kenya featured in the HBO documentary, “A Small Act.” After receiving his law degree with the help of a Swedish benefactor, Mburu could have easily become a successful lawyer and live a cushy, problem-free lifestyle. Instead, he chose to focus his career on human rights activism and pay forward the generosity he received to create a foundation for Kenyan to receive scholarships to prep schools in their homeland. Mburu was an activist while living in Kenya and after receiving his education, he continued to be an activist by working with Amnesty International, Global Rights and the United Nations to train human rights activists in different parts of the world to become more effective in human-rights advocacy. You can probably attribute Mburu’s benevolence to the African mentality that each person needs to leave this world in better shape than when they came into it, which seems to be absent from the minds of most Americans. But there are examples of grown- ups working to better the world in the US. Billy Wimsatt doesn’t embody the typical standard of youth in America: His enthusiasm for preserving democracy mirrors the optimistically driven ideas of a young person. The 37-year-old Chicago native began Pennies For Democracy, a grass-roots-driven fundraiser based in Washington D.C., in response to the Supreme Court’s 5-to-4 vote against limiting corporate spending in candidate elections. Wimsatt’s style of protesting? Standing on the steps of the Supreme Court building with a jar of pennies. “Our country is not for sale. Our democracy is not for sale. They have their millions. But we’ve got jars and jars of pennies,” states Wimsatt on the Facebook page for PenniesforDemocracy. The idea that something as simple as a penny can symbolize the voice and power the everyday citizen has in the democratic process is very inspiring, especially to a young person who may feel powerless or insignificant against unjust legislation; and Wimsatt predicts that this will be the appeal of his cause. “Our pennies are powerful. Our pennies say: ‘In God We Trust.’ Our pennies say: “E. Pluribus Unum” –from many, one. Our pennies say: ‘Liberty,’” he says. While Wimsatt admits he hasn’t pushed PenniesforDemocracy into the public eye, his focus right now is on a 12-week voter-engagement effort that allows youth from Missouri to make voter guides for the area. In addition to doing extensive work with youth and the political process, he’s also the chief executive officer of All Hands on Deck, a political, organizational and communications consulting firm, an author and an avid blogger. I’m not arguing that any one person is solely responsible for the world’s problems or that anyone has to address an issue on the same scale as Wimsatt or Mburu. But if you feel strongly enough about a problem in the world, then why not set aside some time to brainstorm or volunteer for a cause you believe in or an issue you were once passionate about? It can be as simple as starting a blog about the lack of green energy in your neighborhood or holding a can drive for a food pantry. My point is: Adults shouldn’t allow apathy to take over and lose the drive they had as young people to find effective solutions to issues.